Whether you are on campus for a day or an hour, the Library has much for you to discover. 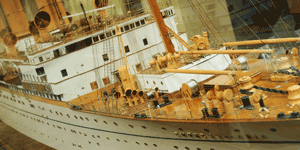 Our collections include nearly 6.5 million items – but we offer a whole lot more as well. From the exceptional Chung Collection exhibition, to artwork in the Irving K. Barber Learning Centre, to notable viewing spots, there is something for everyone at UBC Library. Come explore the life of the Library! Step into Canada’s past and view thousands of artifacts chronicling early B.C. history, immigration and settlement, and the Canadian Pacific Railway Company. 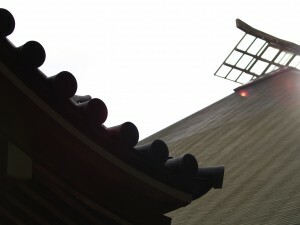 The Chung Collection exhibition is free and open to visitors year round. Can’t make it in person? Visit the collection online. our historical British Columbia map collection of maps printed prior to 1900. You don’t have to focus only on research to enjoy and experience the Library. 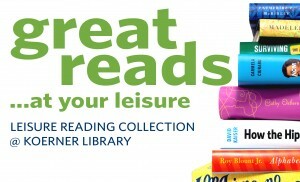 The Great Reads program offers leisure-reading materials ranging from Canadiana to popular fiction. Visit the collection at Koerner Library, Woodward Library and the Irving K. Barber Learning Centre, or browse the shelf online. If you visit the collection in Koerner, be sure to grab a cozy spot next to the fireplace. Koerner Lbrary’s fireplace on Level 3 is a cozy spot to read. Photo credit: Martin Dee. A sandblasted glass chandelier with inspiration from the Dead Sea Scrolls. 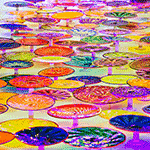 Two hundred multi-coloured plates, covering nearly 60 feet of wall space. These are just two examples of the treasures in the Irving K. Barber Learning Centre. Indeed, the building itself inspires a sense of wonder – and the beautiful artwork inside it will take your breath away. From local artist John Nutter to First Nations artist Brent Sparrow Jr., artwork awaits you on every floor of the Barber Centre. If you also want to check out what happened in British Columbia decades ago – visit the B.C. Historical Newspapers collection and catch a glimpse of yester-year. 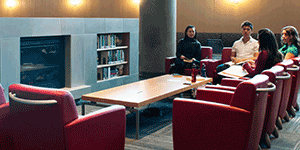 The Library offers many silent and quiet study areas. The Law Library, however, offers studying with an impressive view. 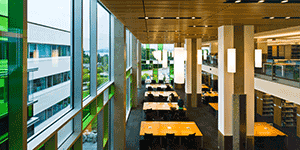 The two-storey reading room – part of the beautiful Allard Hall, which opened in September 2011 – faces the north end of campus and overlooks Vancouver’s North Shore mountains. If you want a place to study history, take in the sights and see stunning art – the Ridington Room in the Irving K. Barber Learning Centre is for you. The two-storey reading room (named after John Ridington, UBC’s first University Librarian) features a 45-panel glass sculpture from artist John Nutter, etched with compasses. The spiral staircase offers visitors a chance to study at tables, lounge in chairs or catch a better look at the artwork. 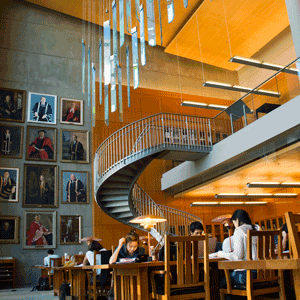 The walls are adorned with portraits of former UBC Presidents, inspiring the students of today to remember their past. A student enjoys the Great Reads collection at Koerner Library. 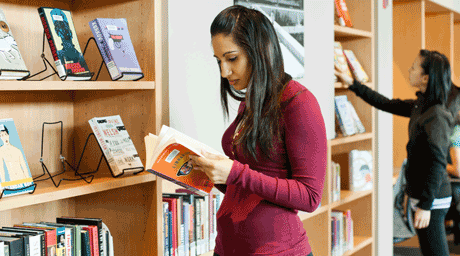 Calling all reading fans: popular fiction has a new home at UBC Library. The Great Reads collection was launched in 2011 by Shannon Simpson, a co-op student who conducted research with colleague Bailey Diers on student reading habits when she was asked to develop a collection of popular titles for Koerner Library. The research showed that UBC residents were craving popular fiction, including bestsellers, pop culture novels and Canadian fiction. The results flew in the face of popular perceptions regarding young people’s reading habits. For instance, nearly 50 per cent of undergraduates dedicated three hours per week to leisure reading. Further, 97 per cent of respondents preferred reading print books; only 39 per cent expressed an interest in e-readers. 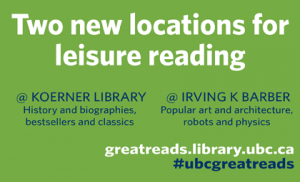 The success of the Great Reads pilot at Koerner led to the project’s expansion – UBC Library users can now browse Great Reads titles at Woodward Library and the Irving K. Barber Learning Centre. Patrons can expect to see subject-themed reads from each branch (such as science and medicine-related titles from Woodward Library), and the possibility of the Great Reads collection expanding to other library branches. Jo Anne Newyear-Ramirez, Associate University Librarian for Collections, is interested in exploring tailored programming over the coming year, including selections based on campus initiatives, holiday/seasonal themes and notable months (such as Asian Heritage Month, which takes place in May). Enjoy your holiday break with some material from UBC Library. What better to get you in the mood for reading than a few reviews from UBC Library! Follow our Facebook page for 12 days of reviews – everything from book reviews to digital collections and more. We will post one new review every day, beginning Monday, December 3, and continuing to Tuesday, December 18. Featuring reviews from UBC Library staff, alumni and fans, this list will be sure to inspire you to start your holidays with some good reading. 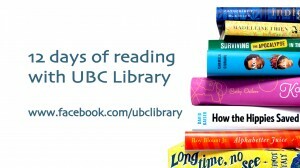 UBC Library’s Great Reads program is featured in the June 2012 issue of the Campus Resident. Last fall, the Library launched the Great Reads program at Koerner Library to provide campus residents, community members, faculty, staff and students easy access to leisure-reading materials ranging from Canadiana to popular fiction. The program has been such a big hit that it’s now featured in the Irving K. Barber Learning Centre, where the collection focuses on topics such as popular art and architecture, non-fiction science best-sellers and more. The article, entitled “UBC Library lengthens list of leisure books for residents,” appears on page 7. Lovers of leisure lit, take note: UBC Library’s Great Reads program has been expanded and enhanced for your reading pleasure. The program has been a hit – so much so that it’s now also featured in the Irving K. Barber Learning Centre, where the collection focuses on topics such as popular art and architecture, non-fiction science best-sellers and more. In addition, the Great Reads website – found at http://greatreads.library.ubc.ca – has been updated. Take a visit and discover available books by location, scan the carousel for new titles and Google book reviews, and check out recommendations. Readers have been receptive to the program – recent figures indicate that 62 per cent of the Koerner collection (328 titles) were checked out, while nearly half of the Learning Centre’s collection (69 titles, many more to arrive soon) had been borrowed. The Great Reads collection is located on the main floor (level three) of Koerner Library and level two of the Learning Centre, adjacent to the Circulation Desk. UBC Library’s Winter Update appears in the new issue of the BCLA Browser (Volume 4, no.1), the newsletter of the British Columbia Library Association. Have a read and find out about the exceptional Videomatica film collection being housed and preserved by UBC and SFU; the B.C. Historical Newspapers Project; a CLIR meeting at UBC Library; the latest instalment of Live-in for Literacy: exhibitions at Rare Books and Special Collections; the Great Reads leisure reading program; and exciting news involving cIRcle, UBC’s digital repository. Looking to delve into some tasty literature? Then curl up with our Great Reads Collection, located on the third floor of Koerner Library. The six-month pilot program features more than 300 books – from bestsellers to Canadiana to popular fiction. This innovative offering provides campus residents, community members, faculty, staff and students easy access to leisure reading materials on UBC’s campus. Popular reading collections, a staple in public libraries, aren’t as common at their academic counterparts. However, 94 per cent of respondents to a recent survey stated that they might, or definitely would, use a leisure reading collection at UBC. As a result, UBC Library’s Great Reads Collection was launched, providing community and campus members with a handy location for leisure reading. An accompanying website features a comment form for feedback. In upcoming months, the website will feature the covers of available books, an RSS feed of new titles and links to book reviews. Let us know what you think – and happy reading!